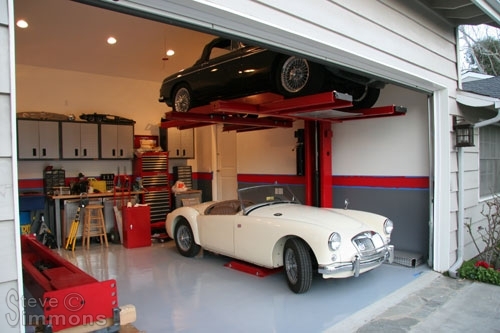 When purchasing an automotive lift, one must sort through the various designs and decide which type will best suit his or her needs. This can be a confusing task. So here are a few considerations to help you along the way. Ceiling Height is an important consideration when choosing a lift design. The required height can be calculated by adding together the overall height of the two vehicles, plus the thickness of the lift ramps or arms, plus the distance between the lift’s safety locks. It’s a good idea to add a little extra for safety and convenience. Keep in mind that you can pull a vehicle onto a lift forwards or backwards. One direction may offer more height clearance than the other. Check with the manufacturers of the lifts you are considering for footing specifications and mounting requirements. Most lifts specify a minimum of 4″ thick reinforced concrete with a 3,000 PSI compression rating. Some lifts are required to be bolted down while others may be left free-standing. Power options normally include 110 or 220 volts. Either will work fine, but 220 will raise your lift faster and is more energy efficient. There are a lot of Chinese-made lifts out there. Typically they are of inferior quality. US-made lifts are most often much stronger, more solid to work on and have better hydraulic components. Parts can be difficult if not impossible to obtain for many Chinese lifts, especially hydraulic parts. Don’t be fooled by advertising. Many lift “manufacturers” including one very large name brand claim to sell US-made products. But only some of their products are US-made while others are cheap imports. Your life is literally depending on the lift not failing while you are under it. Even if the lift is only for storage, an extra few hundred dollars is cheap insurance to not have a car fall from ten feet in the air, destroying the vehicle and anything below it. This is the most common type of lift and typically the most affordable. There are dozens of manufacturers, so shop for quality, shipping cost and customer service. This design usually has the lowest floor strength requirements. 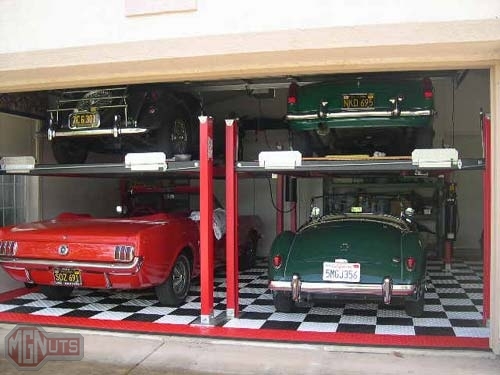 Storage: These lifts are excellent for storage, offering easy drive-on and unlimited access to the vehicle’s exterior. Maintenance: Underbody access in uninhibited, but suspension work will require the use of “jack trays”. These are trays which sit between the ramps and allow a jack to lift the vehicle off its wheels. Once lifted, the vehicle is placed on jack stands, allowing suspension and steering maintenance. 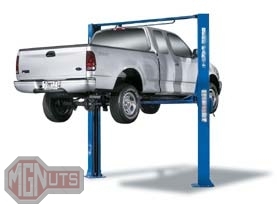 The disadvantages in using a four post lift for this type of work is the time it takes to get the vehicle on jack stands, and the ramps still being somewhat in the way right under the wheels. Floor Space: The stance of these lifts is quite large, taking up more room than any other type of lift. Not only do they take up a lot of room, but the legs near the center of the garage take up what little space you may have to walk between the vehicles. 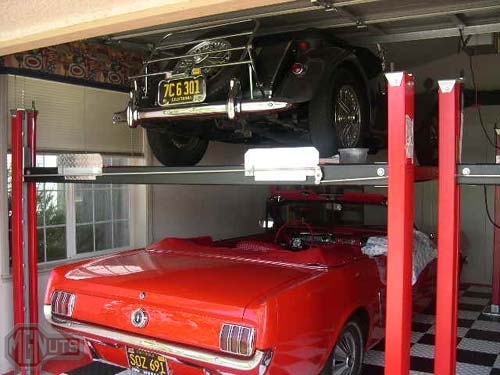 In a small garage, using a four post lift may even prevent you from parking a vehicle alongside, which makes it useless for increasing storage. Measure carefully! Ceiling Height: Specifications vary, but typically the posts are somewhere around seven feet high. Of course the real overall height will be the top of the vehicle parked on it. Don’t forget to account for an open garage door when measuring clearance. Adjustable ramps for parking different size vehicles. A few companies offer custom overall sizing. Trays for oil drip protection. Caster Kits allow the lift to be moved around. Jack trays for suspension work. This design is what you typically see in a repair shop, and will usually cost about the same amount as a four post lift. They can be found for even less money, but you don’t want to get a flimsy 2-post lift! They can be terrifying to work under. Storage: Two post lifts are terrible for storage. There is no oil drip protection and the vehicle’s suspension hangs down under its own weight which can, arguably, damage it over long periods of time. Some lifts do offer attachments to support the vehicle’s wheels while in the air. 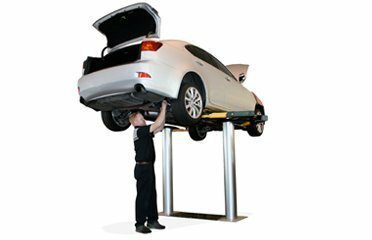 Maintenance: These lifts are by far the best for maintenance, offering unlimited access to the entire underbody. 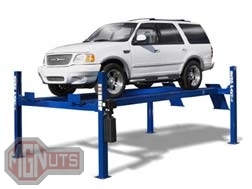 Placing the vehicle on the lift is not difficult but does require getting on your hands and knees and placing the “feet” on the vehicle’s chassis or frame. 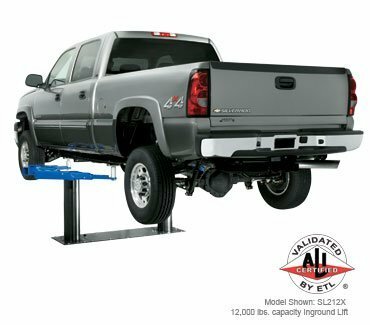 The overall height that you can lift your vehicle will be limited by the brace which spans the two columns at the top of the lift. So the larger the vehicle, the taller the lift you will need. Some two post lifts can be mounted without this support. Floor Space: The columns on two post lifts are large, making this style of lift the widest of the bunch. But they still take up less overall floor space than four post units because, quite simply, there are half as many columns. 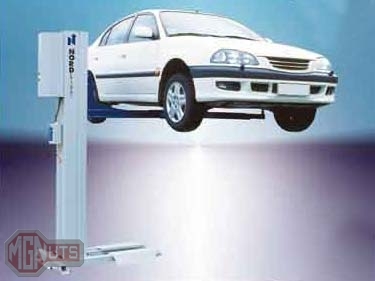 Ceiling Height: Ceiling height for this type of lift is not determined by the vehicle, but by the lift itself. Many two post lifts require a brace to be attached between the top of the two columns. The height of this brace will be your required ceiling height. If you get a design which does not require this brace, then the minimum ceiling height will be determined by the height of the vehicle and how high it needs to go. Trays for supporting the vehicle by wheels instead of chassis. A relatively new design to hit the market is the single post lift. This is not the type you sometimes see in repair garages and tire shops where the post comes out of the ground. Single post lifts have a single column on one side with arms that reach out and hold the ramps. They look like one column of a two post lift mated to the ramps of a four post lift. This design is more costly than both two and four post lifts but has some substantial benefits. Storage: Like four post lifts, this design is excellent for storage, offering easy drive-on and nearly unlimited access to the vehicle’s exterior. When planning position of the lift and vehicles, keep in mind that like two post lifts, the column will be near one of the vehicle’s doors. Plan for the driver’s door being opposite the column for easier entry and exit of the vehicle. 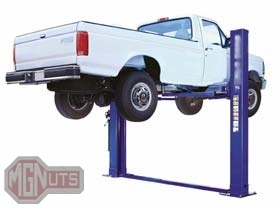 The foot of the single post lift does require you to drive the bottom vehicle over it while parking but is thin enough to not pose a ground clearance issue unless you drive a lowrider. In this case, you can countersink the foot into the ground when installing it. But measure extremely carefully before you mount this way. Once the lift is countersunk, it is not easily moved! Maintenance: Single post lifts are not the best of the bunch for maintenance. Underbody access is partially obstructed by the two arms which stick out from the column. They aren’t huge, but may make it difficult to remove a transmission from underneath the vehicle. Suspension work is carried out the same way as on a four post lift, using jack trays. 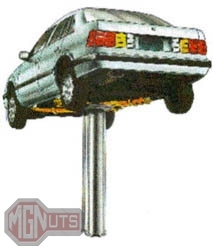 With a bit of creativity, a vehicle can be mounted on a single post lift with the ramps removed altogether, with the vehicle resting directly on the arms. This will allow the suspension to hang free as on a two post lift. Floor Space: This is the real beauty of a single post lift. They take up very little space despite a load capacity equal to the other styles. When raised, the only part of the lift in the way is a single column against the wall. Two of these lifts can be easily installed even in a very small space, and once raised use almost no floor space at all. 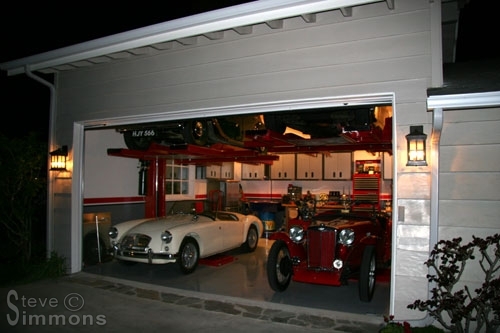 Yes, four cars in a two car garage is realistic! Ceiling Height: Ceiling height is measured the same way as on a four post lift except that the column is taller on a single post design. Add the two vehicle heights together, plus the ramp thickness, plus the space between safety locks and a little extra room for safety and convenience. Your minimum ceiling height will be this number or the height of the column, whichever is higher. Custom sizing is available for these lifts if needed. 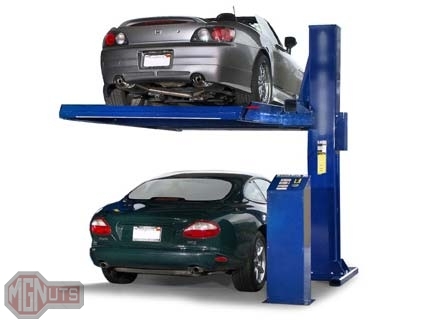 These lifts are what you sometimes see in professional repair garages and tire shops. The lift is submerged into the ground with a central post and has four arms that lift the vehicle in the same manner as a two post design. They are very expensive to install and, along with other disadvantages for the hobbyist, are therefore unpopular for home use. Storage: For the same reasons as two post lifts, these are terrible for storage. Again, there is no oil drip protection and the vehicle’s suspension hangs down under its own weight. Maintenance: Underbody access is partially blocked by the column and the arms. This design is probably the best for suspension work since there is unrestricted access around the vehicle. But forget removing a transmission from underneath. Not gonna happen. Floor Space: These lifts take up no floor space at all since they mount in the floor itself. This is their main advantage. Ceiling Height: Limited only by the vehicle height and how high you need to raise it. This is a newer type of lift, configurable to combine your choice of two post, four post and in-ground designs. They come in three varieties to suit your purpose – arms, ramps and pads. With arms, they work exactly like a standard 2-post above ground lift. A pair of arms is mounted on each side and swing under the car to lift with. 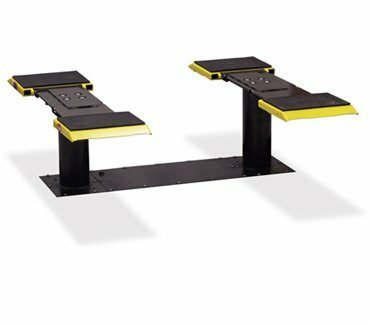 With ramps, the arm assemblies are replaced with ramps similar to what a 4-post lift uses. Raising the car is exactly the same as with a 4-post lift – you simply drive on and raise the car. With pads, the arm assemblies are replaced with two tapered pads which sit directly on top of the posts. This means to raise a car you only need to drive over the pads, make sure you’re in the right spot and press a button. The car is lifted by the chassis. Very simple and much faster / easier than arms. Like the in-ground center post units, this two post design disappears into the ground when stored. But unlike the aforementioned design, underbody access with the two-post in-ground version is excellent. In fact the arm version is exactly the same as a two-post lift except in the case of the ramp or pad version where the “posts” are directly under the car rather than off to the side. This may be a very slight nuisance when working on the chassis but the advantage is that there are no posts in the way when working outside of the car for jobs such as brakes or tire rotation. The biggest drawback of this type of lift is cost. They are expensive to buy and expensive to install. This is probably why you don’t see many of them, especially for non-professional use. Storage: The ramp and pad versions are terrible for storage. There is the same lack of drip protection and support for the suspension as there is on center post (in-ground) and two post (above ground) lifts. While you don’t have a center post blocking a vehicle from parking beneath, the posts on both the ramp and pad versions are still very narrow so only a very small car or motorcycle could fit between them. The ramp version offers good storage capability except for the narrow distance between posts. Personally I’m not sure I would trust one of these lifts (in any variety) during an earthquake anyway. Maintenance: For arm and pad versions you get excellent underbody access, equal to a 2-post lift. Perhaps slightly less with the pad version but the ramps typically span areas such as rockers / sills where maintenance is not performed. With the ramp version, access is the same as with a 4-post lift. Floor Space: Like center post lifts, these lifts take up no floor space at all since they mount in the floor itself. The pad version takes up the least floor space of all lift styles on this page. This style is the same as a single post lift, but instead of drive-on ramps it has arms attached like a two post lift. It’s worth noting that stability is generally very poor on these lifts, and there have been reports of them falling during use. Storage: For the same reasons as two post and in-ground lifts, these are terrible for storage. Again, no oil drip protection and the vehicle’s suspension hangs down under its own weight. 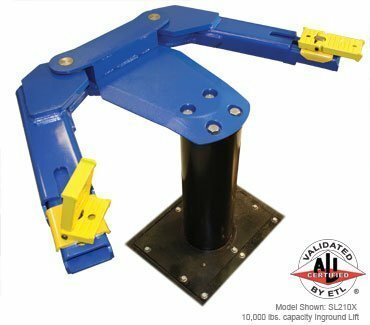 Maintenance: Underbody access is partially blocked by the lifting arms, but otherwise these lifts offer the same advantages as a two post lift. Floor Space: Same as a single post lift. Ceiling Height: Same as a single post lift.